…Because Time for Dinner is approximately $600 cheaper than this one written by Nathan Myhrvold, Microsoft’s first Chief Technology Officer. Reason #33: Because if you buy one, then send me an email about how much you adore a particular recipe, I will have no choice but to express my gratitude with a free “Make Dinner Not War” bumper sticker to the first dozen who do so. I ADORE your cookbook. (I adored Cookie magazine t00). AND I can’t stop telling everyone about it. AND I just read the article about you in Whole Living. And your blog rocks. OK, too weird! Hubs was just joking about buying Modernist Cuisine earlier this week and mentioned it was one of the most comprehensive food/science books written. He is way into this niche: http://www.thequenelle.comCrazy you should mention it. The book was purchased through your Amazon link and we love it around here… nice work! Love the book…please send another sticker, mine got thrown out by mistake. Can’t wait to try out the section on what you already have in your frig! Excitedly just ordered your cookbook. Congratulations on its release. I can only imagine how it must feel for you and your family. Yesterday afternoon, inspired by your post on green-tomato pizza, I found myself at our neighborhood CSA with my toddler asking the farmer: “now what makes an ideal green tomato”? He looked at me strangely, helped me pick a few, and my toddler and I gobbled down the pizza that resulted. Okay, truth be told, he picked off the green tomatoes, but gobbled down the rest, and I was just as happy eating extra tomatoes. Thanks for your posts and for the regular dose of inspiration. I’m pregnant with my second right now–due any day now– so I’ve really appreciated having a little dose of inspiration in keeping the meals coming, since it is such a source of joy and pleasure for all of us. I was so excited when your book came b/c I had pre-ordered it and wasn’t expecting it until September! It is great, as is this blog! I already have my bumper sticker, so send one on to someone else. PS: My 5 year old made the corn/tomato/basil salad last night and told her dad when he came in that it was “Fantastic”! I just read the article about you and the site in Whole Living and had to check out the website– I love it! We rarely ate dinner together as a family when I was growing up (everyone on separate schedules and whatnot), and I always wished that we did, so now I vow to have dinner together with our boys every night (or more like most nights, anyway). I have to wait until payday at the end of the month before I can order the book, but I’d love to have a bumper sticker. It’s definitely a family motto around our house! so i figured i’d just wait until my birthday (november) for this book…but i simply couldn’t wait. i cannot wait for it to arrive! I ordered your cookbook from Amazon last week and I am SO excited for it to arrive. Unfortunately, I used Free Super Saver Shipping, or whatever it’s called, so it will take forever to get here. My order has been shipped! I can’t wait! Love, love, love! I asked my eight-year-old daughter to make a list of what she may want in her lunch this coming school year. 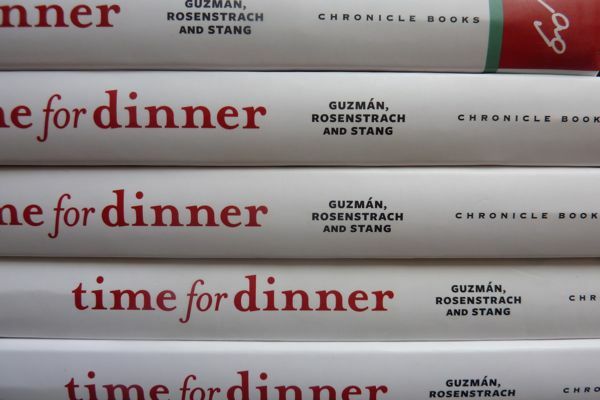 She picked up your book off my nightstand and spent over an hour looking through it, ooohing and ahhing, flagging recipes for her lunch. High praise from a kid, that’s what it’s all about, right? Kudos on an inspiring book. okay, so idid the same thing as rebecca and my 6 year old did the same thing as her daughter! We love this book…made the muffin tin fritattas (without the potato chips because i didn’t have any) and they we a hit with 2 out of 3 kids in the house! Love this site, love the book and thanks for all you do! I flipped through it at the bookstore last night–It looks wonderful! I think I might have convinced the employee who helped me find it to buy it too. I can’t wait to own it, but must wait for payday. Thanks for doing what you do. I’m sure I’m too late for a bumper sticker 🙁 , but I just got my cookbook in the mail and I’m in love! I stayed up late the night I got it with my post-it notes, going through each page and marking this week’s recipes. The ‘If I Could Just Make It to Wednesday’ section is a God send and the Braised Pork is heavenly! Thanks for a fantastic cook book!